Hello and Happy Wednesday! This week seems to be flying by for me! As usual since this is Wednesday, It's time for another Paper Craft Crew Challenge. This week is another fun sketch for you to check out! I used one of my favorite sentiment stamp sets from Simon Says Stamp "You Matter"with the coordinating "You" Die. 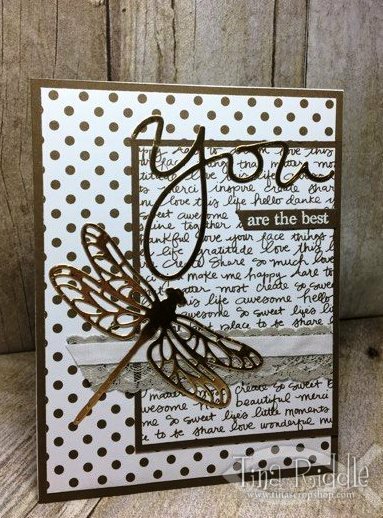 I also used the Stampin' Up Detailed Dragonfly Thinlits Die for the first time. I love dragonflies so I'm not sure why I had not used this before! I used Gold Cardstock to cut out my You Die as well as the Dragonfly Die. The "are the best" sentiment was heat embossed in white on Soft Suede Cardstock to match the matting and the SU Designer Series Paper. The lace trim and white ribbon are SU Retired Ribbons from my stash.